Gmail introduced Google Gears to access Gmail without live internet connection. 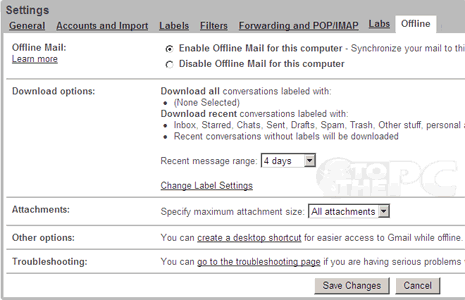 It later introduced “Offline Mail” feature that allows you to download email attachments for offline access. Now Gmail has expanded that feature allowing you to select which message should be downloaded for offline mail access. 1. Goto Gmail.com and login into your Gmail account. 2. Click “Settings” and then click on “Labs” tab. 3. Enable “Offline” lab feature and click “Save Change” button. 4. Now click on “Offline” tab, click enable and check customization options.